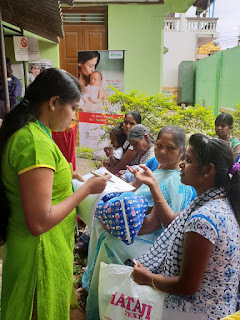 Bangalore, July 26, 2018: Fortis Hospital, Bannerghatta road along with Public Healthcare Centre(PHC) Gottigere conducted a Breastfeeding training initiative for new mothers in Gottigere. A recent data released by National Family Health Survey 4 (NFHS-4) shows that the number of children breastfed within one hour of birth is less than 42% which clearly indicates the lack of awareness around breastfeeding. In line with this, Fortis hospital, Bannerghatta road took up this initiative to enhance mother’s knowledge about their baby’s nutrition intake, right from birth to initial growing months. Mrs. Joyce, a Lactation Consultant, Fortis successfully imparted nutrition knowledge to nearly 50 newly mothers from the near-by area. Fortis Hospital has been conducting, yearly breastfeeding activities to support the “Breast-feeding Week” (August 1st – August 8th).